ST. GEORGE — Zion National Park has been working to draft a visitor use management plan since 2016. Locals and visitors alike have voiced different opinions about what is best for the park, and many businesses in surrounding communities fear what will happen if visitor numbers are restricted. Over the last decade, Zion National Park has experienced increased visitation and overcrowding. The number of visitors has nearly doubled since the ‘90s, and 4.5 million people went to the park in 2017. Park officials drafted alternatives for the Zion visitor use management plan fall of 2016 to better preserve the park and its resources, as well as provide visitors a safer, more enjoyable park experience. But the decrease of visitors to the park could come with a price. After seeking public opinion, the park came up with three alternatives, which are outlined in the National Park Service Preliminary Alternative Concepts Newsletter. Alternative A, the no action plan, proposes that the park continue operating under its current management plan. In alternative B, officials would establish an online reservation system to visit the frontcountry area of the park. The number of visitors allowed would depend on the park’s carrying capacity, which is still being determined. 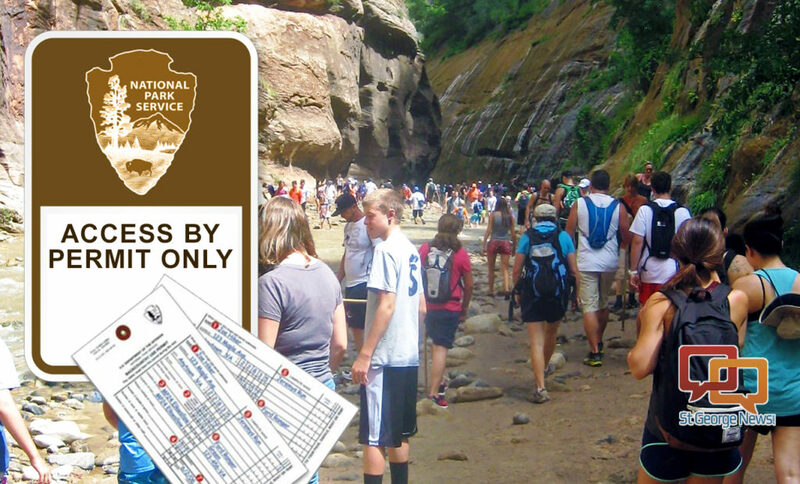 Alternative C would require visitors to use an online reservation system and obtain a permit, but only for the most popular, overcrowded hikes in the park. The park accepted public comment on the alternatives from July to August last year. 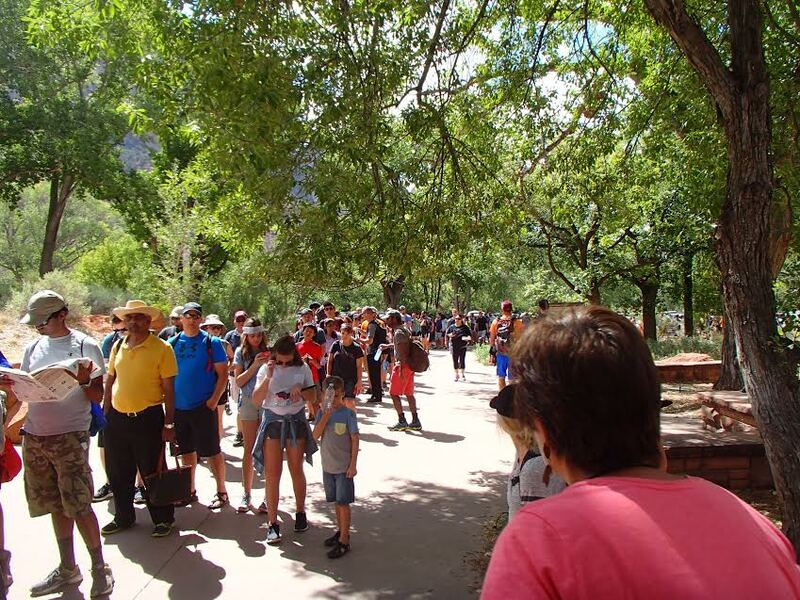 Jake Millard, assistant general manager at the Zion Ponderosa Ranch Resort in Orderville, said he recognizes the need for change to deal with overcrowding, but not at the expense of reducing the number of visitors. “Yes, there’s more to be done to provide a better park experience, a better Southern Utah experience, but we don’t think now is the time to implement a hugely restrictive plan,” Millard said. He said he does not think that visitors should be required to have a reservation to enter the park as a whole, but agrees with the idea of having a reservation system for the busiest sites, though only during busy months. Cutting the number of visitors to the area would significantly affect businesses such as tour operators, restaurants and lodging, Millard said. Fewer visitors to the area equals fewer customers for businesses who thrive on tourism. He suggested that the park work to draw more visitors to the east side of the park for a different Southern Utah experience. He said the east side has room for expansion and the potential to relieve some of the crowding in the main area of the park. His business is located on the east side of the park. Zion Ponderosa Ranch Resort sent an email to its customers three days prior to the last day of public comment, outlining the company’s stance on the situation and urging them to comment. The park analyzed the public comments and are using them to refine the draft for the final plan. The entire public comment summary report is posted on the National Park Service website. The park received approximately 1,650 responses from 47 states and the District of Columbia, and 11 responses came from outside of the U.S. Many people were supportive of alternative A because they did not like the idea of a reservation system, but others felt it would fail to provide a solution. Those who support alternative B liked that it would help with the overcrowding problem while still allowing visitors to access every destination in the park. Those who opposed the plan simply did not like the idea of a year-round reservation system. Supporters of alternative C liked that it would solve the overcrowding problem and allows visitors to plan detailed trips to specific sites. Opponents think it is too restrictive, complicated and potentially costly to implement. In addition to providing feedback on the different alternatives, commenters made suggestions about improvements for things like commercial services, park facilities, entrance fees, education, impacts on park resources and other alternatives to consider. Many business owners, including Breck Dockstader, owner of Cliffrose Lodge and Gardens, Springdale Visitor Center and several other vacation rental companies and restaurants, said they would like to see a different solution than the alternatives presented. Dockstader is also a board member of the Utah Tourism Industry Association and the Zion Canyon Visitors Bureau. A common concern among business owners is that they still do not know the park’s carrying capacity. Without this information they are hesitant to support a reservation system, not knowing exactly how it would affect their business. Shelley Cox, owner of Blondie’s Diner in Springdale is unsure of exactly how a reservation system would affect her business until more details are released, and the park has been unable to answer her questions about an approximate visitor capacity. “There are just too many unknowns that they can’t answer,” Cox said. She said she is sure that if access to the park is restricted too much, it will affect all businesses in the area. Not only in Springdale and other communities right outside of the park, but in Hurricane and St. George as well. Dockstader said that while the park has been very open to hearing business owners’ concerns, to his knowledge they have not conducted an economic impact study. Multiple attempts to contact Zion National Park officials were unsuccessful. Not only would reducing the number of visitors impact businesses, like hotels, that rely on tourism, but would also affect other businesses in town, like gas stations and stores, Dockstader said. While Dockstader does not agree with the proposed alternatives in their current form, he does know the busy seasons for Zion strain the park’s resources and staff, and wants to be a part of the solution, not a part of the problem. All the business owners want more more more, some of the rest of us think we already have way too many people coming to Utah. The overcrowding has pretty much taken the Park away from me, there are just too many people trying to use what is a very small space. Yes I know the area of the park is large,but there is only one tiny road in. ’taken the park away from me’. Wow, the nerve of those other people who live here on Earth. How dare they!!!! I do not see an alternative. There are too many motels in Springdale to support the number of park visitors. What did they think was going to happen! I would love to have a day every three months, or so, for Washington County residents only. You do realize that there are 150,000 plus residents living here in Washington County. I don’t imagine you’d get your all alone lunch with a vista on top of Angel’s Landing with that plan. Its so good to see how the Trump administration policies are helping business. Now we see. Of corse the cultists dont. Vote blue for a change. 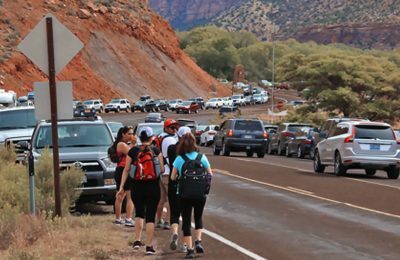 The Zion traffic is now Trump’s fault? You make yourself look dumber with each post. Oops, wrong article. Sorry, but no need to be insulting. I tried twice this spring to get into Zion without success. Never seen it so busy. Really don’t want to pay Springdale $22 to park on the road for the day. Visitation by reservation is the only option to maintain sanity for both visitors and park staff. I have to agree with you on this. I haven’t dared go to Zions for the past 4 years because I really don’t want to wait 3 hours for standing room on the shuttle. Add on the ridiculous parking fees that are being instituted by the businesses and Springdale city itself, and the cost to enter the park – It’s just not worth it. I can have a better time going to Snow Canyon State Park or just going out for lunch and a movie. I went up to Yellow Stone National Park last summer and it was an absolute nightmare. Parking lots for the individual trails, hot springs,pools and picnic area were packed. Traffic was congested with hundreds of tour/charter buses. Traffic was further congested when people would park on the side of the narrow two-lane road (which there is clear signing to not do!) so that they could jump out and stand in the middle of the road take a picture of a single buffalo. There was even cars parked in the main travel lane.